"There's something fishy going on when a person is spending money that is meant to treat people with HIV/AIDS on a housing campaign," a critic said. A high-profile AIDS organization has spent millions of dollars bankrolling an anti-development ballot measure in Los Angeles, sparking criticism that it's squandering a fortune that might otherwise have been spent on healthcare. The AIDS Healthcare Foundation is the primary financial backer of Measure S, which would significantly halt large-scale real estate development in Los Angeles for two years. According to the Los Angeles Times, the foundation — which is headquartered in a Hollywood high-rise — has spent $5.5 million trying to convince voters to support the measure in the upcoming March 7 election. Backers of Measure S have argued that it is needed to curb out-of-control development. In an opinion piece published Thursday in the Times, AIDS Healthcare Foundation President Michael Weinstein said "we believe LA is in the grip of a social justice crisis over whom our city really serves." He went on to frame Measure S as a way to help AIDS patients who are battling gentrification and ever-rising rents that have made Los Angeles one of the least affordable cities in the US. AIDS Healthcare Foundation President Michael Weinstein on Sep. 17, 2015, in Los Angeles. But critics say the measure will actually make affordability problems worse, and that the foundation — which Weinstein describes as the "largest HIV/AIDS medical care provider in the world" — has no business spending vast sums on a local real estate initiative. Perhaps most pointedly, LA City Controller Ron Galperin slammed Weinstein last month for injecting "his organization into a debate over land use that has nothing to do with HIV or AIDS or healthcare," Curbed reported. “And, in the process, unfortunately, AHF is squandering millions of dollars that should be spent on HIV prevention and treatment," Galperin continued during a news conference at LA's LGBT Center. Galperin also published a piece in the Times Friday saying the measure is "based on a false premise" and "is poor public policy." 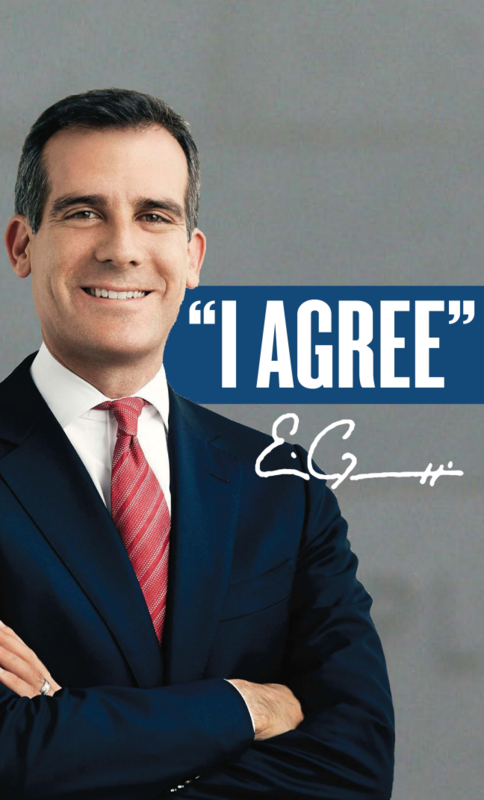 LA Mayor Eric Garcetti also "vehemently opposes Measure S because it will kill jobs, halt our work to house the homeless, and drive rents higher," his spokesperson Yusef Robb told BuzzFeed News. A homeless man walks down the street in the Skid Row area of downtown Los Angeles in October 2007. The AIDS Healthcare Foundation and Measure S have drawn criticism from a wide array of other local leaders and organizations. California Gov. Jerry Brown opposes it, as does nearly the entire LA city council and a long list of (somewhat strange bedfellows) including homeless advocates, labor unions, environmental groups, chambers of commerce, developers, and housing policy experts. Much of the financial backing for the campaign against Measure S has come from Crescent Heights, the Times reported, a real estate development company that wants to build two towers next to the AIDS Foundation's headquarters. The consensus among these opponents is that, in the words of University of Southern California public policy professor Jan Breidenbach, Measure S "will worsen, not help, our housing crisis." That has raised questions about both the AIDS Healthcare Foundation's involvement, and its tactics. Michael Eisman, a former downtown Los Angeles neighborhood chairman who worked with Weinstein and the foundation between 2012 and 2015, expressed disappointment that resources are now being devoted to Measure S.
"That's doesn't make a lot of sense," he told BuzzFeed News. "There’s something fishy going on when a person is spending money that is meant to treat people with HIV/AIDS on a housing campaign." Eisman — who is HIV positive and spends roughly $4,000 a month on treatment — left the foundation in part due to concerns about the way it used funds. The Times has repeatedly editorialized against the measure, including last month when it noted how much good the foundation has done in the world but added that it's "puzzling that Weinstein is using his nonprofit and the money it brings in to bankroll Measure S, a deceptive and draconian ballot initiative on city land-use policy that has absolutely nothing to do with healthcare." The editorial surmises that the measure is the result of Weinstein looking out of his 21st story office window and not liking the construction cranes he saw below. Another editorial, published earlier this week, chronicles what it describes as various deceptive campaign materials, including the use of quotes from the Times itself. "Lying to the voters is never an appropriate use of anyone’s money," Robb, the mayor's spokesperson, added Friday. "The Yes on S campaign has lied, lied, and lied again to the voters of Los Angeles," Robb continued. "It's just wrong." The Los Angeles County Sheriff's Department has also become involved. Last week, the department sent a cease and desist letter to the Yes on S campaign after it mailed out a document meant to look like a sheriff's eviction notice. The sheriff's letter, which was addressed to the "Coalition to Preserve LA Sponsored by AIDS Healthcare Foundation," accused the campaign of misleading the public. An image released by the Los Angeles County Sheriff's Department identifies a Yes on S mailer as counterfeit. 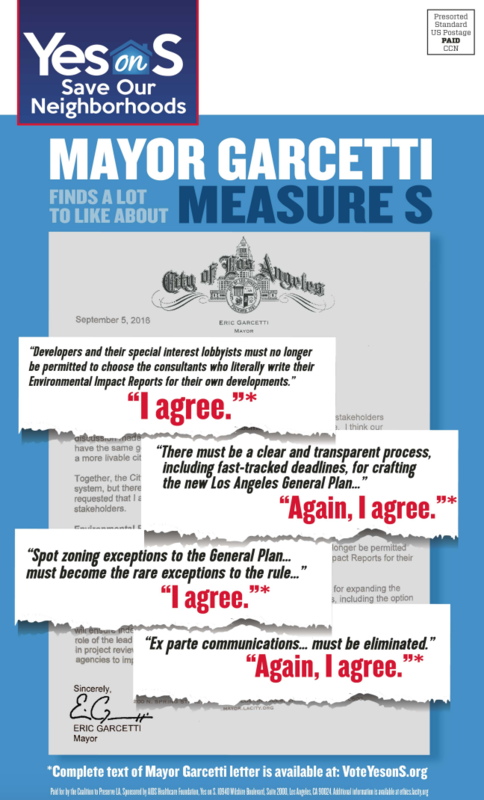 The Measure S backers, however, refused to comply with the cease and desist order, instead responding with their own letter questioning the sheriff's "underlying motive" and accusing the department of trying to "silence the proponents of Measure S and/or portray them in a negative light." The AIDS Healthcare Foundation did not respond to BuzzFeed News' requests for comment Friday. Weinstein also hasn't responded to specific criticisms of the campaign. However, in his Times op-ed he laid out the AIDS Healthcare Foundation's involvement by arguing that "we must put a stop to the unmitigated greed and corruption that will forever change L.A. from a welcoming place to a city built only for the privileged."